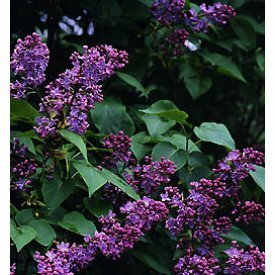 Beautiful sweet "Old Fashioned" lavendar Lilac shrubs are sure to send your garden into blooming blis. These "Old Fashioned" (Syringa vulgaris) 2 year old shrubs will be ready to bloom their fragrant flowers next summer. Use as a hedge, beautiful border or as a Bonsai specimen. Plant a few in your yard for an awesome spring-summer display of beauty with a mature height of 6' - 12' feet Mature height of 6' to 12' feet Full to partial sun Soil well drained/moist Blooms mid spring- early fall. Size at shipping 6-12 inches, Shipping bare root. These have come out of their dormant stage in the last few weeks and growing quite nicely some might be a little taller.